Just last week we were talking about the new unlimited data offer from Powertel that is supposed to start a return to glory and hopefully, good graces with disgruntled clients for the Internet Access Provider. It turns out, Africom also introduced its own special offer on data in the same period. The Africom Super Data Promotion is a follow-up to the MiChoice Data offering that Africom has had going for about half a year. This time, Africom has come up with a promo that isn’t for browsing only or focused on social media, but is aimed at subscribers that want to enjoy internet downloads and streaming. 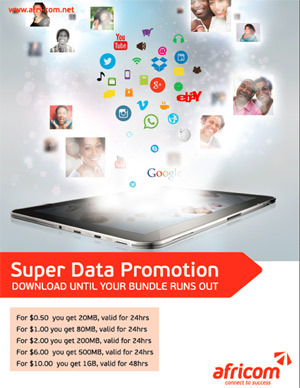 With an entry bundle priced at 50cents for 20MB and a 1GB bundle set at $10 the competition isn’t just Powertel (which has somewhat similar bundles that are more expensive), Africom has introduced the cheapest internet package in Zimbabwe. It seems Africom is responding to a tougher economic climate just like every other service provider that is competing for subscribers’ attention. The competitive prices for the Africom Super Data will likely be a very strong offer for subscribers keen on downloads that have established that Africom service is readily available in their areas. However, points for this promotion are dropped by the limited validity periods for the bundles that range from 24 to 48 hours, which extend even for the 1GB service. Sure, 1GB is easy to gobble up if you are keen on torrents for Game of Thrones or a Shonda Rhimes TV series, but not everyone buys 1GB for downloads. Then again, having just hours to burn through that can be easy if you are watching Zim Dancehall or Nafuna TV videos on YouTube. For Africom this is more of a solution than anything and is simple; if you want to browse, stick to the MiChoice Bundle, if you want to stream and download, choose the Super Data bundles. What are your thoughts on the new Africom Super Data Promo? Powertel promo is way better!!!!!!!!!! i can leave my torrents running at night and wake up apera ese!! Check the powertel data validity period, this is rubbish. Compare to africom. Do u think most people buy 1GB for only 48 Hours (2 days if you dont know). NXAAAAAA! the money that pple use to pay for your services does not have an expiry date mr ISP, why does your product have one? Why put an 24hr expiry date. That doesn’t make sense. In fact that’s almost nonsensical to say the least. I dont’t think that beats $39 Zol package. Price aside Africomm dongles/units are a joke. The speeds are ridiculous…even when you are in the Africomm office. this isn’t cheap for starters it has the biggest offer has a 48 hr expiry date.Considerinf ZESA can go for more than three day after you just bought the data…. this isn’t cheap for starters it has the biggest offer has a 48 hr expiry date.Considering if ZESA can go for more than three day after you just bought the data…. Powertel yakadhakwa at least Africom realize that people need to stream and download. The MiChoice unlimited works really well for browsing but if you need to access certain sites or download certain files you get restricted. I think this is fair. I hope powertel does something similar and copies Africom prices. I am currently using Africom with their dongle because data offerings are better. With Africom’s packages (I use the unlimited one) it is way slower than dial-up. When you call them they hide behind the fair-usage-policy. I use it for basic browsing and they say that I am unfairly using the connection. letts be honest with ourselves.ZOL has th cheapest data followed by POWERTEL bt powertel has th fastest internet connection. POWERTEL’S weakness is they have no wifi dongles. i have a telone dongle,i have shelved it ,TOO EXPENSIVE.